If you have quite a bit of music, and you have rated all your songs (yes, this seems daunting, but there is a quicker way!) you will find yourself with a group of songs that have four and five stars. Now, currently in that list, I have 11,578 out of 29,204 songs in that list! You may think that is a lot, but take a second to consider that – that’s not even 40% of my music. I only listen to around 40% of my entire library! Weird, why have all that music if you listen to less than half? I guess you could say that, but I have really streamlined my songs to only listen to songs I enjoy on a regular basis. However, lately I have found myself skipping songs. Why? I find that sometimes, even though I have rated a particular song 4 or 5 out of 5, I just don’t want to listen to it that day. 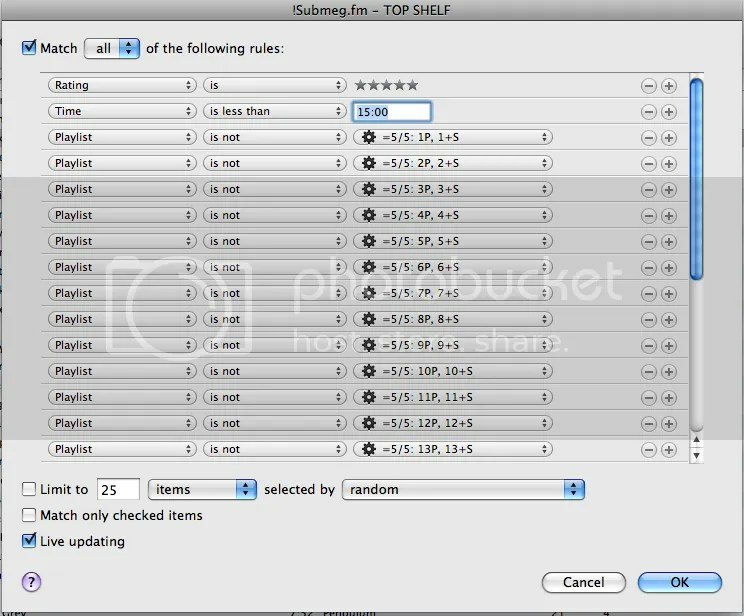 So I took my submeg.fm playlist (see step two) and tweaked it. I went a step further and created a playlist that has ONLY songs that are rated 5 out of 5. This created a playlist with only 1,856 songs. That was more manageable I thought. Over the last few weeks however, I have found myself skipping songs again! I was a bit annoyed, as these were supposed to be the best of the best! I had a think and considered if maybe all the songs that I had at 5 out of 5 were really worth it. I mean, if I’m skipping them, surely they can’t be? I decided against revising my ratings, as this would’ve taken ages. I had another think and looked at my play counts and realised that some songs had more skips than plays! So the solution became obvious – remove songs that had more skips than plays. Now my TOP SHELF playlist has been cut down to 1763 songs and if I ever skip the song more than I play it, it is cut from my TOP SHELF and put back into my Submeg.fm playlist only. Quite useful! I adapted the last playlist by putting all the 5/5 xP x+S playlists into a sub folder and then instead of selecting every playlist is not for each of the filtering playlists you can just select playlist is not the folder containing all the filters. Much quicker way of doing it than having to go through each playlist is not. Also since your main playlist filters for 5 stars it seems to me that you wouldn’t need to filter each sub playlist for five stars? Really appreciate all the other smart playlist tips. Just got into smart playlists recently and your site has been really helpful in learning the power of the smart playlist.